Automatically switches from front-wheel drive to all-wheel drive (awd) according to the driving conditions, helping to ensure reliable handling and stability. Examples of conditions where the system will switch to awd are when cornering, going uphill, starting off or accelerating, and when the road surface is slippery due to snow, rain, etc. The slip indicator light will flash while the trac/vsc systems are operating. system off may make it easier for you to rock the vehicle in order to free it. To turn the trac system off, quickly press and release . seconds while the vehicle is stopped. *: On vehicles with pre-collision system, pre-collision brake assist and precollision braking will also be disabled. The pre-collision system warning light will come on and the message will be shown on the multi-information display. Trac, hill-start assist control and downhill assist control cannot be operated. Sound may be heard from the engine compartment when the brake pedal is depressed repeatedly, when the engine is started or just after the vehicle begins to move. This sound does not indicate that a malfunction has occurred in any of these systems. Any of the following conditions may occur when the above systems are operating. None of these indicates that a malfunction has occurred. Vibrations may be felt through the vehicle body and steering. A motor sound may be heard after the vehicle comes to a stop. The brake pedal may pulsate slightly after the abs is activated. The brake pedal may move down slightly after the abs is activated. 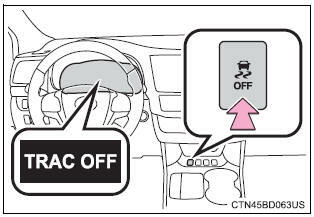 if both the trac and vsc systems are turned off, automatic re-enabling will not occur when vehicle speed increases. the shift lever is in a position other than p or n (when starting off forward/ backward on an upward incline). The accelerator pedal is not depressed. The parking brake is not engaged. Approximately 2 seconds elapse after the brake pedal is released. The limits of tire gripping performance have been exceeded (such as excessively worn tires on a snow covered road). The vehicle hydroplanes while driving at high speed on wet or slick roads. Directional control and power may not be achievable while driving on slippery road surfaces, even if the trac system is operating. Drive the vehicle carefully in conditions where stability and power may be lost. Do not overly rely on hill-start assist control. Hill-start assist control may not operate effectively on steep inclines and roads covered with ice. Unlike the parking brake, hill-start assist control is not intended to hold the vehicle stationary for an extended period of time. 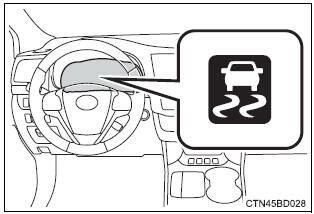 Do not attempt to use hill-start assist control to hold the vehicle on an incline, as doing so may lead to an accident. The slip indicator light flashes. Always drive carefully. Reckless driving may cause an accident. Exercise particular care when the indicator light flashes. As these are the systems to help ensure vehicle stability and driving force, do not turn the trac/vsc systems off unless necessary.